Electronic surveillance of employees is increasing every year, according to the Electronic Monitoring and Surveillance Survey, done by the American Management Association (AMA) and The ePolicy Institute each year between 2001 and 2007. In an earlier article, Surfing the Web at Work, the status of employee monitoring and some of the reasons why employers might want to monitor employee email and internet use was reviewed. The article also reviewed the consequences both employees and employers are experiencing in the workplace because of inappropriate use of electronic equipment, email, and the internet. There are pros and cons of the electronic surveillance of employees at work. This review of the pros and cons of electronic surveillance of employees at work will help employers decide what is best for their organization. Not every workforce, workplace, or work culture and environment is a candidate for electronic surveillance at work. In fact, in some work environments, depending upon the culture and environment desired, electronic surveillance of employees would injure trust, injure relationships, and send powerfully wrong messages to the workforce. Powerful reasons exist to monitor employee online behavior at work. These reasons are compelling for many employers and understandable as organizations are observed. Organizations seek to protect themselves and their employees from the illegal, immoral, and problematic distribution of content and the visitation of non-work sites while employees are working. In another experience in a small manufacturing company, employees complained that their supervisor was surfing the web during most of the business day. The network administrator confirmed that the supervisor was visiting job board sites, doing online banking, shopping, chatting and posting on message boards, reading recipe sites, and spending hours in personal email for over six hours a day. How Should a Company React to Problematic Online Behavior? On the day the company was prepared to fire this employee, the employee gave notice and reached with the company an agreement about an orderly, mutually beneficial transition. In yet another experience in a small company, it was discovered that an employee had been doing her ancillary bookkeeping for her personal business on company time and in her company-provided computer. The employee gave notice and was escorted from the premises. The employee later begged to have this material back and the employer kindly provided the records. With these examples in mind, note that electronic surveillance of employees at work can yield results that are beneficial to the employer. Note also that in none of these three companies was the electronic surveillance of employees practiced. But, frequent IT intervention was practiced. Suspicious behavior by the employees in question prompted the review of electronic records. So, many employers have the capacity to use electronic surveillance of employees but choose not to practice electronic surveillance. Additional reasons exist to place employees under electronic surveillance at work. These are key reasons. Productivity issues are an employer concern. The nature of the sites that employees visit concerns employers because of their potential to be seen as creating a hostile work environment. The same problem exists with employee-forwarded email and jokes. Employers want to trust their employees to practice good judgment but their experiences indicate that they don't always exercise good judgment. Employers are concerned about creating an environment of harassment if employees surf to inappropriate places and share the URLs. Employers are concerned about their ability to produce email and web records to defend against lawsuits. They need records to defend against lawsuits. "Workers' e-mail and other electronically stored information create written business records that are the electronic equivalent of DNA evidence." Flynn noted that 24% of employers have had email subpoenaed by courts and regulators and another 15% have battled workplace lawsuits triggered by employee email, according to the 2006 AMA / ePolicy research." To help control the risk of litigation, security breaches and other electronic disasters, employers should take advantage of monitoring and blocking technology to battle people problems-including the accidental and intentional misuse of computer systems and other electronic resources." "Depending on the level of freedom allowed in a company or the type of employer, electronic surveillance of employees may not be desirable. Companies that employ new college grads, who have absolutely blurred lines and are online all day, are an example. In fact, 99% of the population will be fine without electronic surveillance; fewer than one percent of employees are causing the damage that allows all of the bad stuff for employers to kick in." Avramidis said that electronic surveillance of employees can affect the working relationship between an employer and employee. 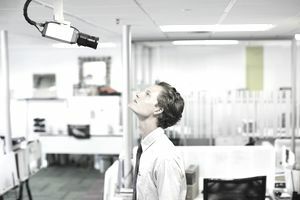 "For the employee who is doing the right thing and focusing on work and using technology moderately for personal use, electronic surveillance will have no impact. For bad employees, electronic surveillance will put a strain on their relationship with their employer." A major concern of some employers is the potential damage to a work culture that fosters trust and employee commitment and motivation. Electronic surveillance of employees appears incongruent with such an environment. According to Avramidis, "Employees judged on the results of their work are spending more time online doing personal things to manage the personal business. There is a cross-over between where work leaves off and the personal work begins. The concern becomes real for employers when an employee is not meeting goals, or not living up to expectations." In fact, for committed employees, there is as much cross-over at home between work and personal business as there is at work. That is part of the discretionary energy, the energy that employees voluntarily contribute above and beyond expectations, that employers hope to earn. "Indeed, employees spend an average of 3.7 hours a week on the Web for personal activities at work and 5.9 hours a week online at home doing work-related tasks, according to a study by the University of Maryland's Smith School of Business and Rockbridge Associates, a market research firm based in Great Falls, Virginia." The final reason why employers may not want to use electronic surveillance of employees is employee privacy. According to Eric J. Sinrod, a partner in the San Francisco office of Duane Morris, where he specializes in technology and litigation matters, employee concerns about electronic surveillance are legitimate. "Still, workers have legitimate concerns that their privacy rights might be invaded. The primary federal statute in this area is the Electronic Communications Privacy Act of 1986 (ECPA). The ECPA, codified at 18 U.S.C. 101 et seq., bars the intentional interception of any wire, oral or electronic communication, or the unauthorized access of stored communications. "The ECPA does have three exceptions, and if any one of these applies, monitoring can take place under appropriate circumstances. The exceptions generally allow employers to monitor business-related phone calls, to monitor communications when there has been employee consent, and to retrieve and access stored e-mail messages." As you see, there are many pros and many cons to the electronic surveillance of employees in the workplace. Weigh all of these factors when you decide how to proceed with employee monitoring in your workplace. In my company, where we develop software, we have mostly college-degreed, young employees who are goal-oriented and technologically advanced. We appreciate every ounce of discretionary energy they contribute at work and at home. A certain amount of Web surfing is necessary to stay abreast in our field and to obtain competitive intelligence. Electronic surveillance of our employees is nowhere on our radar. I'll be surprised if it is ever an issue. then, take a deep breath and—trust them.